IoT Hub is a fully managed service from Microsoft Azure as part of Azure IoT Suite that enables reliable and secure bi-directional communications between millions of IoT devices and your solution back end. Multiple device-to-cloud and cloud-to-device communication options, including one-way messaging, file transfer, and request-reply methods. Built-in declarative message routing to other Azure services. A queryable store for device metadata and synchronized state information. Secure communications and access control using per-device security keys or X.509 certificates. Extensive monitoring for device connectivity and device identity management events. Provides device libraries for the most popular languages and platforms. IoT Hub and the device libraries help you to meet the challenges of how to reliably and securely connect devices to the solution back end. Embedded systems.with minimal or no user interaction. Remotely available, with less physical access. . Reachable through the solution back end. Intermittent, slow, or expensive network connectivity. Use proprietary, custom, or industry-specific application protocols. Created using a large set of popular hardware and software platforms. IoT Hub provide solutions to meet all the above constraints of a connected device. In addition it also provides scale, scalability and reliability. It also addresses most of the connectivity challenges through following capabilities. Device Twin: With Device twins, you can store, synchronize, and query device metadata and state information, and these are stored in JSON format. IoT Hub persists a device twin for each device that you connect to IoT Hub. This feature was introduced in Novemeber’16 with General availability of Iot Hub. Per-device authentication and secure connectivity. You can provision each device with its own security key to enable it to connect to IoT Hub.There by enabling you to manage or block devices as desired. Route device-to-cloud messages to Azure services based on declarative rules. IoT Hub enables you to define message routes based on routing rules to control where your hub sends device-to-cloud messages. Monitoring of device connectivity operations. You can receive detailed operation logs about device identity management operations and device connectivity events. Support for latest and widely used IoT protocols and provides extensibility: Protocols such as AMQP 1.1 or HTTP 1.1 and MQTT 3.1 are supported. We could also provide additional protocol translation using Azure IoT Gateway SDK at Device/Field/Protocol Gateway layer. 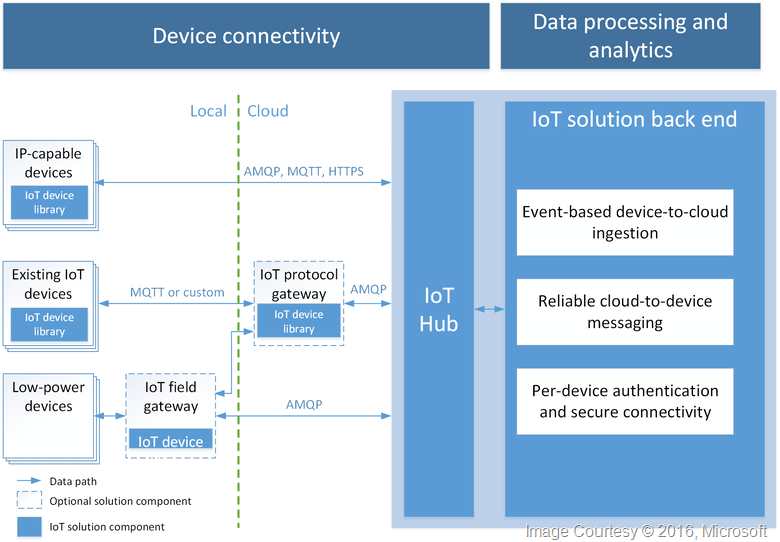 Azure IoT Hub can bring more value to organizations to bring in their field devices to cloud with real-time data capture and bi-directional communication. It solves the problem of lack of proper communication infrastructure for devices to communicate or operate on real-time basis. Pay per use, less investment infrastructure that would let you scale as you grow. Do you feel some similarities between IoT Hub and Event Hubs service already exists as part of Azure Platform? In my later articles I would be covering some of the major differences. To see how Microsoft IoT can transform your business, visit www.InternetofYourThings.com.